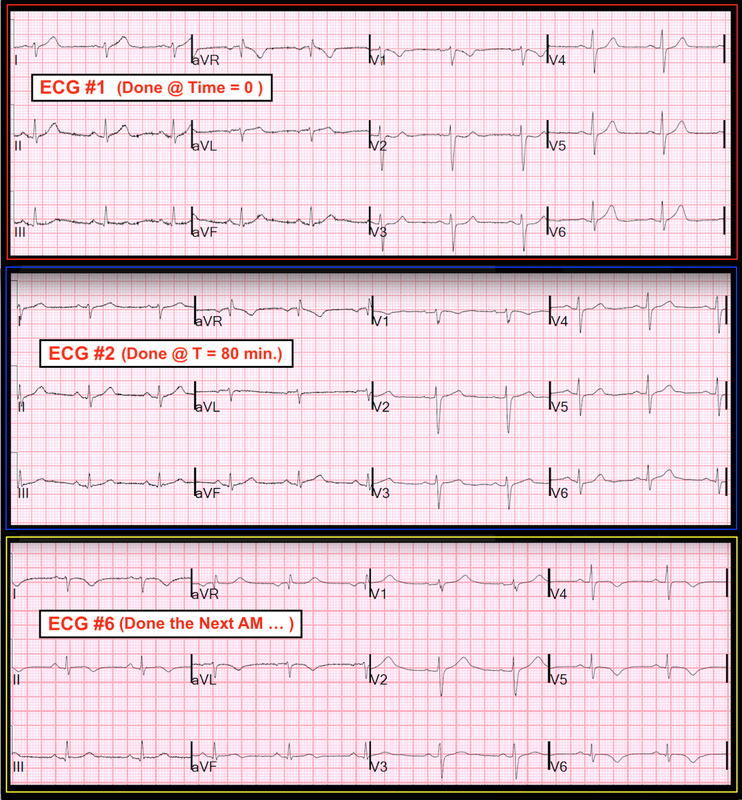 Dr. Smith's ECG Blog: A completely healthy 30-something woman with acute chest pain -- this post is loaded with info !!! A completely healthy 30-something woman with acute chest pain -- this post is loaded with info !!! A previously healthy young woman presented to the ED with one hour of acute onset right sided chest pain and pressure, very severe, radiating down the right arm. My impression: without any other information, I looked at this ECG and 3 features stood out: 1) the T-wave in lead I is hyperacute. It is far too large for that QRS. 2) The T-wave in V6 is far too large; it is almost as tall as the R-wave, which is distinctly abnormal. 3) there is slight downsloping ST depression in V2 which is classic for ischemia/posterior MI. There is also a slight bit of ST depression in V3. This is an Occlusion Myocardial Infarction (OMI) until proven otherwise. This is difficult to interpret, but I believe it is consistent with the ECG: To my eye, it shows a lateral (on the right) wall motion abnormality. I'm not sure this was seen, and some may dispute the ultrasound interpretation. NTG sublingual was given and a repeat ECG was done at 80 minutes after arrival (In such a case, repeat ECGs should be done every 15 minutes). The hyperacute T-waves are resolved. The ST depression is resolved. The dynamic ECG proves that this is active ischemia. The persistence of chest pain, in spite of improvement of the ECG, suggests persistent ischemia. D dimer was negative, making dissection or PE much less likely (these are also likely causes of elevated troponin, and dissection could cause MI by dissection into the coronary ostium, but PE is very unlikely here). She was given heparin and clopidogrel. The next troponin was 1.04 ng/mL. Cardiology was consulted. The plan was to admit to on heparin drip. A 3rd troponin returned at 2.84 ng/mL. There is no STE in V7-V9. Notice that the QRS in V7-V9 is very small compared to V1-V3. V7-V9 are simply opposite leads to V1-V3, but with a lot of intervening air. This is why the "criteria" for ST elevation in posterior leads is only 0.5 mm. Without any STD in V1-V3, there is unlikely to be STE in V7-V9, though it is possible that the proximity of the posterior leads to the posterior wall may result in STE. In this case, the STD has already resolved. If recorded during STD in V1-V3, posterior leads would have been much more likely to be positive. However, this posterior ECG is of academic interest only. The patient has proven MI (elevated troponin not otherwise explained) with persistent uncontrolled pain and needs the cath lab now. There is also a positive ECG and ultrasound! If this posterior ECG does NOT show any posterior ST elevation, the patient still needs to go to the cath lab. She went to the cath lab at this point. There was a subtotal occlusion of a 2.0 mm 1st obtuse marginal branch off the circumflex (OM-1). It was suspicious in appearance for a spontaneous coronary artery dissection (SCID). [see this post: An athletic 30-something woman with acute substernal chest pressure] All other coronary arteries were normal. There was no evidence of coronary disease, further supporting SCID. "The OM-1 was wired with a Luge wire and the several balloon inflations up to 12 ATM were performed with a 2.0 X 30 mm balloon. This re-established TIMI III flow with residual non-flow limiting dissection. The chest pain was nearly resolved at the termination of the procedure." "In most labs, the smallest stent is 2.25 mm (Medtronic now has a new 2.0 mm), so if a lesion is involving a 2.0 mm vessel, many would consider this caliber technically too small for a stent, and would simply do plain old balloon angioplasty (POBA). Others might try to squeeze in a small stent." Peak Troponin I was 20 ng/mL (this is not a small infarct. 2/3 of STEMI have a peak troponin I greater than 10 ng/mL). There are reperfusion T-waves in all lateral leads. There are large T-waves in V1 and V2. These are posterior reperfusion T-waves! --If recorded from the posterior wall, posterior reperfusion would show inverted (negative polarity) T-waves. --These positive waves are added to the normal positive T-wave of anterior wall repolarization (the anterior wall was not affected by the ischemia), giving doubly positive T-waves. --Thus, reperfusion of the posterior wall results in larger T-waves than normal. Decreased left ventricular systolic performance-mild to moderate. The estimated left ventricular ejection fraction is 40%. Evidence for ischemia/infarction in a large circumflex distribution. 1) Learn to recognize subtle ECG manifestations of OMI. These were very specific findings. These were not "Nonspecific repolarization abnormalities" (as read by the computer and the overreading physician). 2) The circumflex distribution is the "electrocardiographically silent" area of the heart. It is very common to have a completely normal ECG with an acute occlusion of the circumflex or one of its branches, even with a large MI. 3) Posterior leads may help to detect an otherwise electrocardiographically silent MI. Diagnostic threshold is 0.5 mm in one lead, but absence of any STE on posterior leads does not rule out MI. Furthermore, if there is ST depression in V1-V3, posterior leads may be falsely reassuring. 4) Any patient with sudden chest pain and a positive troponin must be considered to have acute MI, pulmonary embolism, or aortic dissection. Without any SOB or tachycardia, and with ECG evidence of OMI, OMI is the diagnosis until proven otherwise. There was no need for an ultrasound to make the diagnosis. The negative d dimer effectively ruled out PE, and aortic dissection did not fit and is much more rare. Therefore, it is acute MI until proven otherwise, and if the pain cannot be controlled by medical therapy alone, then the patient should go emergently to the cath lab within 2 hours!! This is not just my opinion, but the recommendations in the guidelines of the American College of Cardiology/American Heart Association and of the European Society of Cardiology. The ESC makes the point that such patients, if suspected of ACS as cause of their ongoing symptoms, should go emergently to the cath lab even in the absence of ECG or biomarker findings. In other words, you don't need an ischemic ECG or even a positive tropoinin! In spite of the ESC and ACC/AHA recommendations, I suspect from my anecdotal experience of correspondance with others through this blog and blog email, that it is rare for patients with NonSTEMI to go to the cath lab emergently, even if they have ongoing pain, unless there is diagnostic ST elevation that meets criteria. This is supported by a major metaanalysis of NonSTEMI that shows that 25% of 40,000 patients who underwent next day angiogram for their NonSTEMI had a fully occluded artery (1). Thus, a huge percentage of all patients who have OMI do NOT go to the cath lab very early, as recommended by the guidelines. I believe this is due to the persistent belief in a real STEMI-NonSTEMI dichotomy. infarction: a systematic review and meta-analysis. European Heart J, 2007. 38, 3082-3089. It is uncertain what effect the delay will ultimately have on myocardial function. The artery appears to have been occluded, or nearly so, for about 6 hours. A small amount of perfusion from TIMI-1 flow or from any collaterals may keep much of the myocardium alive until reperfusion, and the acute stunning from ischemia can result in a large area of myocardial dysfunction (as we see here), most of which may recover. On the other hand, it might not recover. Without further data such as MRI, it is impossible to know in the early hours after ischemia/infarction if the dysfunction is permanent. Time will tell: a convalescent echo at 6 weeks may show much better function, or may show absence of recovery. Persistent Chest Pain, an Elevated Troponin, and a Normal ECG. At midnight. OMI Can be Diagnosed by "Pseudonormalization of ST Segments"
Abnormal ST-T in V1-V3. What is it? Many interesting and informative twists to this case. The lesson in this case is highlighted in the Learning Points put forth by Dr. Smith. OMI will continue to be overlooked, even by cardiologists — as long as clinicians cling to old definitions and refuse to accept the wisdom written in ACC/AHA/ESCGuidelines which state: When ACS is suspected as cause for ongoing symptoms — such patients should go emergently to cath, even in the absence of ECG or biomarker findings. And, when either ECG or biomarker findings are present — the need for urgent cath becomes that much greater … The most unfortunate aspect of this case — is that both elevated Troponin and acute ECG changes were present, yet not recognized and/or acted on. I’ll focus the rest of my comments on comparison of 3 key tracings in this case (Figure-1). Figure-1: Comparison of 3 of the 6 tracings shown in this case (See text). As per Dr. Smith — worrisome findings include the hyperacute T wave in lead 1 — another hyperacute T wave in lead V6 (that is clearly taller-than-it-should-be considering the QRS complex in this lead) — and, abnormal ST depression in V2 and V3. PEARL #1: When there are obviously abnormal ECG findings in several leads (as highlighted here by Dr. Smith) — Look extra carefully at the remaining leads because: i) If you do so, you will often find additional abnormalities (albeit more subtle); and, ii) The more leads with abnormal ECG findings — the stronger the support of your conclusion that OMI is in fact actively ongoing! In Figure-1 — The T wave in lead aVL is also most probably hyperacute. Keep in mind that the frontal plane axis is shifted markedly to the right. In such cases, the T wave axis in limb leads such as aVL often follows closely behind the QRS axis. In other words, a common normal finding in patients with a vertical frontal plane axis (that results in a predominantly negative QRS complex in lead aVL) — is for the T wave in aVL to also be inverted. Instead, the T wave in aVL in Figure-1 is clearly upright, and appears slightly bigger-than-it-should-be given the tiny r wave in this lead. I’ll emphasize that as an isolated finding — I would not make much of this upright T wave in lead aVL. But given the context of 4 clearly abnormal leads (as mentioned in the 1st bullet above), with obvious hyperacute ST-T wave change in the other “high lateral” lead (ie, lead I) — lead aVL is also most probably abnormal. BOTTOM LINE re Figure-1: As per Dr. Smith — In a patient with new-onset ischemic-sounding chest pain, the combination of abnormal ECG findings in this tracing should be considered as indicating OMI until proven otherwise. ECG #2 — which was done 80 minutes after ECG #1. As per Dr. Smith — there clearly has been change in ST-T waves in multiple leads. That said, by itself — this 2nd ECG does not look to be overly concerning. PEARL #2: The purpose of doing sequential ECGs on patients suspected of having an acute evolving coronary syndrome — is that IF lead-to-lead comparison of sequential tracings confirms change (not due to axis shift or lead placement variability) — this represents a dynamic ECG change, which as per Dr. Smith confirms the presence of active ischemia. PEARL #3: It is much easier to determine IF there is sequential change when you put the 2 tracings you are comparing next to each other. Doesn’t the difference between ECG #1 and ECG #2 become obvious in Figure-1 for the appearance of ST-T waves in leads I, III, aVL, V2, V3 and V6? PEARL #4: When you compare sequential tracings lead-to-lead — then ECG findings that may have initially appeared subtle will often show obvious change. For example — the T wave in lead I of ECG #2 is clearly less tall than it was in ECG #1. And, my point about the ST-T wave appearance of leads III and aVL in ECG #1 being abnormal is confirmed by the fact that despite absence of a change in axis, the T wave in lead III is now more positive in ECG #2, and the T wave is now flatter in lead aVL. ECG #6 — obtained the next morning on this patient. As per Dr. Smith — there are now ST-T wave changes of reperfusion in multiple leads. Spend a moment looking at each of the 12 leads, with focus on the evolutionary change in ST-T waves as you go from ECG #1-to ECG #2- to ECG #6 done the next morning. 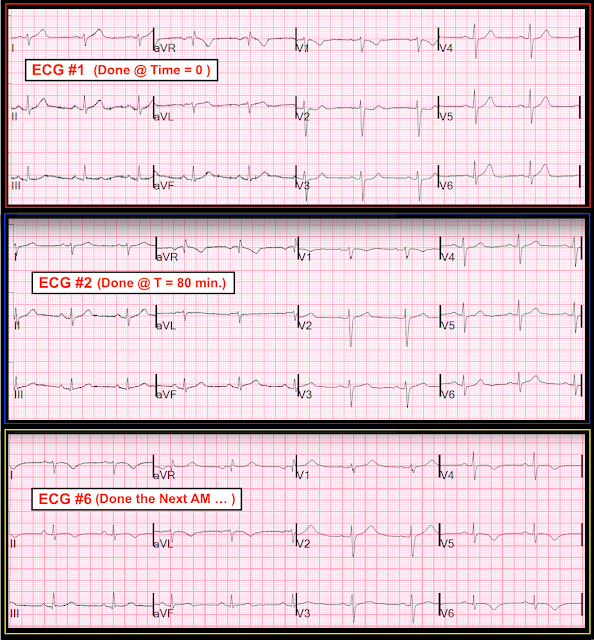 PEARL #5: Now look again at ECG #2 — and imagine this tracing was the only ECG that you initially saw in this case. How would you interpret ECG #2 in this context? The answer to this question illustrates the often unappreciated point that in-between the hyperacute ST-T wave stage — and — the stage of spontaneous (or therapeutic) coronary reperfusion — the ECG may look deceptively normal… That’s why clinical context, serial tracings, stat Echo during chest pain, biomarkers, and lead-to-lead comparison between ECGs is so essential for detecting less obvious OMI cases. Our thanks to Dr. Smith for this superb teaching case! Regarding posterior leads, you mention, "some do not have STD in V1-V3 but do have concurrent STE in V7-V9; (posterior leads sometimes more senstive)." Tom Bouthillet and I have been on the hunt for a case of standard-lead-negative, posterior-lead-positive, posterior STEMI for nearing a decade now. I've never seen one and I'm pretty sure he hasn't either--have you seen one yet, or just referring to reported cases? I'm pretty sure it's impossible, and any reports are probably due to dynamic ACS with occlusion during the posterior ECG but an open artery at the time of the standard tracing. I refer to old papers by Zalenski and Matetzky from the 1990s. They report sensitivities of posterior leads that imply there must have been such cases. I suspect that they did not do simultaneous recordings. I have seen many cases where V1-V3 had ST depression, then the posterior 12-lead is done later. You can see that the ST depression in V1-V3 is gone at the time the posterior leads are recorded, but this is not commented on. And the conclusion is that posterior leads are not sensitive. What really happened is that the artery reperfused in the interim (shown by the resolution of STD in V1-V3) and therefore one cannot comment on the utility of the posterior leads. Similarly, I suspect that in these old studies, the first ECG showed no STD in V1-V3, but by the time the posterior leads were recorded, the ECG had evolved and now there is STE in V7-V9. this gets reported in the trial results and you have a falsely elevated sensitivity of posterior leads over V1-V3. -I admit that I'm not so familiar with what a normal posterio-leads ECG should look like, but in this case it catches my eyes that there is a Q/R ratio in V8 and V9 that, if fuond e.g. in peripheral leas, would suggest estebilished MI. am I right or is it normal to see this in posterior leads? 2) I believe that qR is normal in posterior leads, but now I'm going to pay more attention to that. Not sure. Was this patient on full medical therapy including nitro drip ? As we always forget the phrase "ongoing chest pain despite medical therapy" without explaining exactly what does maximum medical therapy mean. What are your thoughts regarding the VERDICT trial with regards to the use of GRACE score in these situations ? I agree with you, we should definitely move away from STEMI/NSYEMI dichotomy but we should have a standardized approach, maybe including TTE findings like the one you showed, If I was on call I would have asked for immediate intervention, but you know, calling and waking up my faculty with this EKG and a 30 something lady, the answer is always going to be (ACS protocol and we will deal with it first thing in the morning). I'll add my anecdotal experience to the point raised by Vince DiGiulio and Tom Bouthillet — namely that I've also never seen a case in which the standard 12-leads were negative for posterior infarction, and the diagnosis was only made from posterior leads ... Instead, I've seen many observers think the standard 12-leads were negative for posterior infarction, when in fact they were not ... GREAT points raised by Steve regarding the TIMING of standard leads vs posterior leads! Amazing case and comments ,thanks! I suspect if this patient presents at noon Wednesday she goes to the Cath Lab emergently. If she comes in at 2 AM in the morning Saturday she does not. The absence of ST elevation makes it a lot easier for the cardiologist to decline going to the hospital for an emergency intervention at an inconvenient time. Unfortunate, but that is human nature. It is another reason we need to eliminate the STEMI/NSTEMI dichotomy. So true, but this was during the day on a weekday.